I am not going to ramble on and on about how you should stuff your turkey, season your turkey, cook your turkey, prepare your turkey or handle it in any manner. I am simply going to give you a few basic facts and observations about our national bird....well, almost our national bird at least. For generations, your family has had their own special way of preparing the best of all year round meals served in your household. 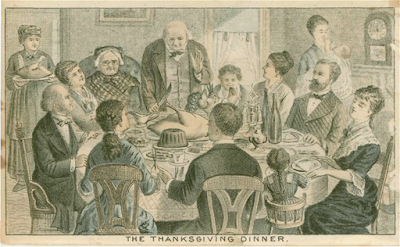 Far be it for me to tell you that your grandmothers, grandfathers or any ancestor of yours was wrong in any aspect of roasting this Holiday fowl. Nor will I tell you the best way to season a bird. Again, we all have our tastes and all hold dear our methods as passed down from one generation to another. Heck, I do as well. But there are certain points and tips that will help your tried and true recipe shine through without a hitch. Case in point...that point that pops out when the turkey is cooked. As you are aware, many turkey companies add this little "pop out" button to let you know when it is sufficiently cooked. This is great, especially for the beginners or for those who may not have a temperature gauge on hand on this busiest of all Holidays. But did you know that these little buttons are set to pop out at between 185-195-degrees F? Yup, too overdone for me! That's almost 30 degrees TOO cooked! I always remove the turkey from the oven when it reaches 160-degrees F(when taken in the proper place of the breast). When I remove it from the oven to rest for at least 15 minutes, it ALWAYS continues cooking to AT LEAST another 5 degrees, bringing the internal temperature to the appropriate 165-degrees F.
We all know how to safely thaw a turkey, so I will excuse myself from saying anymore on that subject. But I will add a couple of tips for an extremely crisp skin. 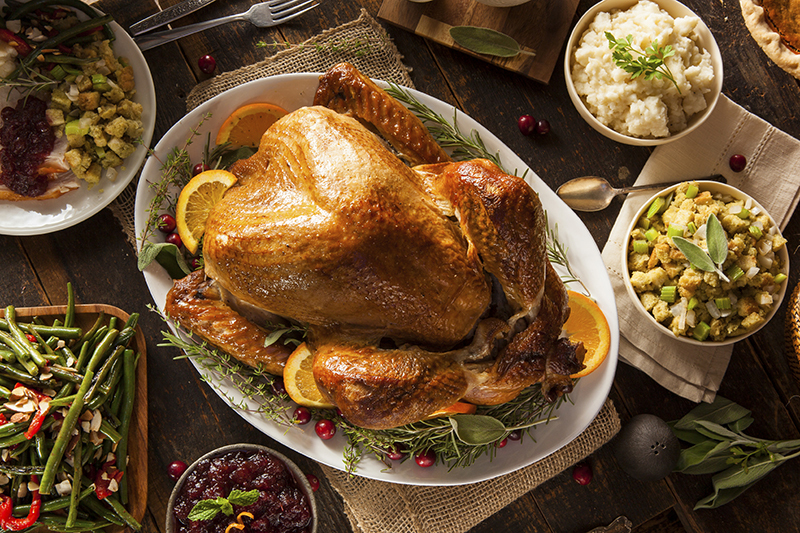 Once you have thawed your turkey(hopefully the day before), leave it uncovered in your refrigerator overnight. This will dry the skin off from any moisture. If you don't have the time to do this, at the very least, heavily dab the skin with paper towels before baking. You want the skin to be as dry as possible because moisture only slows down the browning process as well as giving you a blotchy browning. Now we have crispy dry skin, how about moist meat? The rule of thumb for this ultimate result is fat. Fat directly on the meat, underneath the skin. Sure, the skin provides a little fat, but not nearly enough to keep the turkey meat moist as it is cooking. The meat itself has even less fat then the skin. So loosen the skin from as much of the turkey as you can(don't forget the important legs and thighs) and rub some soft butter on the meat. As much or as little as desired. If you want some extra flavor, simply mix in some herbs and spices into the butter before rubbing. Now for the cooking part. Another tip for crispy skin is the temperature. The skin NEEDS to be at LEAST 300-degrees F for the maillard reaction to happen. This is the process in which the skin will turn color, dry out and crisp up. Any temperature below that and this action will not be accomplished. Now say you are having a horde of people over for Thanksgiving dinner. How much turkey do you need? I ALWAYS supply 1 1/2 pounds total bird weight per person. This seems like a lot, but by taking the bone weight into consideration, along with any moisture loss(turkeys have at least 50% water by weight), I think you will find this weight distribution will be perfect for everyone. DO NOT..I repeat..DO NOT...buy one large, 30 pound bird to feed the masses! Buy two 15 pounders instead. The larger the bird, the longer cooking time needed. This only significantly increases cooking time, thereby drying your turkey out substantially! Truss or not to truss? Yes, indeed! But loosely tying the legs together with pure cotton string, this helps to evenly cook the turkey, rather than bunching one part of the turkey with another, creating a space or two where heat is fighting to get in there and cook evenly. How about the wings? Well, if you are considering nibbling on the wing tip, or even the thin segment of the wing where there is no meat to begin with, then cover it with foil. I find no reason to do this, but of course have at it if you want. Place your turkey on the most shallow pan you can, but one deep enough so that no juice will spill out onto any inside oven surface. This will help brown and crisp as much of the bird as possible as well as evenly cook. Now if you are adding vegetables to the mix, then this tip is irrelevant. Which bring us to another subject...gravy. If you are going to use pan dripping as part of your gravy, then add some carrots, halved onions and celery to the pan first, then the turkey plopped right on top. Not only will these vegetables add to the flavor of your gravy, but it acts as a lift, of sorts, to keep your turkey from "stewing in its own juices", making it a mushy mess on bottom. If desired, use a large, all metal serving spoon or two underneath the bird if you don't have a rack to fit your pan. Cook at 350-degrees F...PURE AND SIMPLE! Not any higher or lower. Some swear by roasting at 425-degrees F for a certain length of time, then reducing temperature to somewhere in the 300's. Nope! Always rest your turkey before carving. I really don't need to say this anyway because every single person I know has NEVER removed the turkey and started carving the moment it is removed from the oven. There is so much that needs to be done that most of the time, the turkey rests more than the 15 minutes, needed anyway. Brining. I am not even going to get into brining because like handed down traditions, everyone and their mother has their own little secrets. The only thing I will add is that you should dry the skin as much as possible after brining for crispiness. When I brine, I follow my own advice above and remove the turkey from the brine the night before and let the bird sit in the fridge overnight before plopping that bad boy in the oven. And for a last little bit of a sweet tip. We all love pumpkin pie. But have you EVER replaced that American favorite with a Southern flair? Try Sweet Potato pie instead. Why you ask? Because sweet potatoes are much sweeter than pumpkin and deliver, what some believe, to be a far superior flavored pie. To help prove a point, try just a simple mashed pumpkin straight from the can sometime. No spices or anything. Kind of bland, don't you think? Now try a bite of mashed sweet potato. See what I mean? You don't need much in the way of spices or sugar to transform a good pie into a great one. Use about 1 1/4 pounds sweet potatoes that have been peeled, cooked and mashed per pie, with only a half cup of brown sugar, 1/2 cup milk, 2 eggs and 1 teaspoon cinnamon and see what I mean. Superb! There, that's it! Post done.